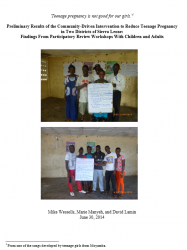 Th is paper reports on an evaluation of a program in Sierra Leone that sought to support the community reintegration of young women and girls formerly associated with armed groups and forces. Starting in 2012, the Inter-Agency Learning Initiative on Strengthening Community-Based Child Protection Mechanisms and Child Protection Systems established a community-owned and driven intervention to reduce teenage pregnancy in the Moyamba and Bombali Districts in Sierra Leone. 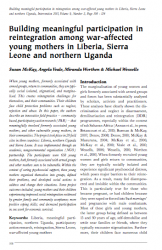 In this paper, the authors describe community-based participatory action research (PAR), an innovative field practice that meaningfully involved young mothers formerly associated with armed groups and other vulnerable young mothers in their communities in Liberia, Uganda, and Sierra Leone.